My company has a policy of shelling out performance incentives as a means of rewarding their employees. The fiscal year did good to me, I with a few other colleagues made the cut to get our hands on the ever so lucrative Epicure card for enhanced savings and experiences at the Taj group of hotels. Applicable at across 250+ restaurants, 600+ bars, 80+ hotels and 60+ spas worldwide, Epicure is a very powerful loyalty card. The membership package comes with the physical Epicure card and electronic certificates. The membership card allows me to earn 50% as points on the first three dining transactions and a 25% earning for all successive dining transactions. The Taj Mahal Hotel on Mansingh Road and The Taj Diplomatic Enclave are my two go to Taj hotels in Delhi. Known to house legendary restaurants like Varq and House of Ming, through Epicure Taj gives an opportunity to indulge in the best while saving. I have made my way to 5,000 points already. I’m very excited to earn more points through the coming year and redeem them for room night stays and more meals. I have heard that a few restaurants at Taj have redone their menu to include new dishes. Now I don’t have to think twice before going to taste the new menu – I know while dining I will only be saving for future stays or experiences at Taj. I had a conversation with my colleagues and got to know that they’ve had similar earning stories. I’m so happy to have been gifted this by my company. I have really enjoyed my experience with the card and plan to renew next year. Taj Hotels Palaces Resorts Safaris is the epitome of Indian hospitality. My family has been a patron of their legendary service for decades now. For all special occasions and celebrations, the Taj has always been our first choice. Hence, getting a membership for the Taj was quite a no-brainer for me. As I began my research to know more about the membership offered by Taj, I noticed that the Epicure is one of the largest loyalty programme of its kind in the country offering the best in food, beverage, spa and point redemption! Epicure offers its members the perfect opportunity to experience the best in Indian hospitality, service and luxury at 80 hotels in India and 16 hotels across the world. Since I’ve become an Epicure member I have enjoyed the most celebrated restaurants and some stellar bars worldwide. From the most divine Creme brulee at Wasabi by Morimoto in Mumbai to the absolutely indulgent Galouti and Kurkure Kumbh at Masala Art in Delhi, my wife and I have tried it all at Taj and earned every rupee we spent in the form of points which I can redeem later. Epicure membership also gives me a complimentary membership to the Silver Tier of the Taj InnerCircle membership which allows me to earn points each time I stay at one of the iconic Taj hotels. What’s even better is that the membership comes with a free room night stay and a couple of upgrade vouchers to enjoy higher category of rooms at The Taj, all at at no extra charge. 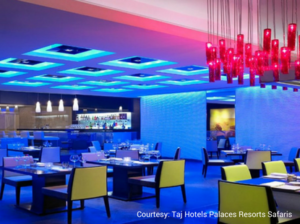 Epicure welcomes you with 50% off on the first 3 dining spends at Taj hotels and for all successive dining experiences you get a heady 25% back as points. Epicure is one of the largest loyalty programme of its kind in the country offering the best in food, beverage, spa and point redemption! Epicure offers its members the perfect opportunity to experience the best in Indian hospitality, service and luxury at 80 hotels in India and 16 hotels across the world. If there’s one thing I recommend more than anything is to experience tranquility at the Jiva Spa. Said to be an all-natural spa, it offers the perfect amalgamation of ritual, technique and ingredients to heal the mind body and spirit. Off all the treatments offered, Shirodhara is a personal favourite. Being an Epicure member obviously has its perks at the Spa too – a 25% earning on treatments at Taj properties across the world and even if you are not staying at the hotel. Unwinding with a drink after a hectic day is always a good idea; more so when the drinks flow easy and you don’t have to pay for every glass you drink. Since it’s Happy Hours from 6pm to 8pm across all bars for Epicure members, most of our small scale house parties have now shifted to the bar at a Taj property. Good company, good food and a free drink for each drink consumed! What more can you ask for! So folks, you’ve got it all covered with this membership – 50% point earnings on first three dining transactions and 25% point earnings on all successive dining spends, 25% point earnings at spas across the world, happy hours at all bars, a complimentary room night stay and two room upgrades. The Taj Group of Hotels have got you a pretty sweet deal with this membership, I see no reason to hold back.